History, magic, romance and royal intrigue—you’ll find these spellbinding elements in Eleanor Herman’s Blood of Gods and Royals series. The story of a young Alexander, heir to the throne of Macedonia, unravels with richness and depth in a vivid world where empires rise to power, magic and myth stir, and deception lurks in plain site. Legacy of Kings, the first book, was a top favorite of 2015 (re-reading now actually! ), and I anxiously await Empire of Dust, the sophomore novel in this vibrant, action-packed series. 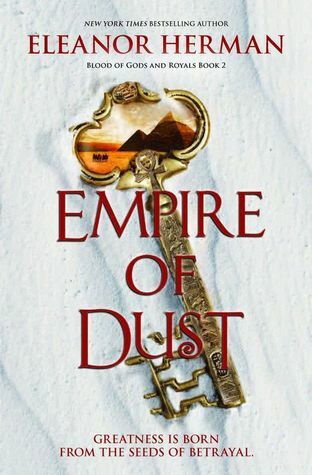 I’m honored and excited to be one of the very few to offer up an ARC of Empire of Dust! Scroll to the bottom of this post to enter, and you can be one of the first to read this highly anticipated novel! New York Times bestselling author Eleanor Herman entwines the real scandals of history with epic fantasy to reimagine the world’s most brilliant ruler, Alexander the Great, in the second book of the Blood of Gods and Royals series. Note Voice of Gods is an optional prequel. 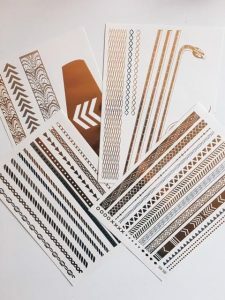 One lucky winner wins an ARC of Empire of Dust, plus some gold snake temporary tattoos inspired by Olympias! (pic below) Open internationally.